Being one of the Top Cape Cod Photographers they must know their way around. I grew up on the Cape so there isn't much I don't know about the area. The best beaches, the best spots, the backroads are all a part of being a Top Cape Cod Photographer. 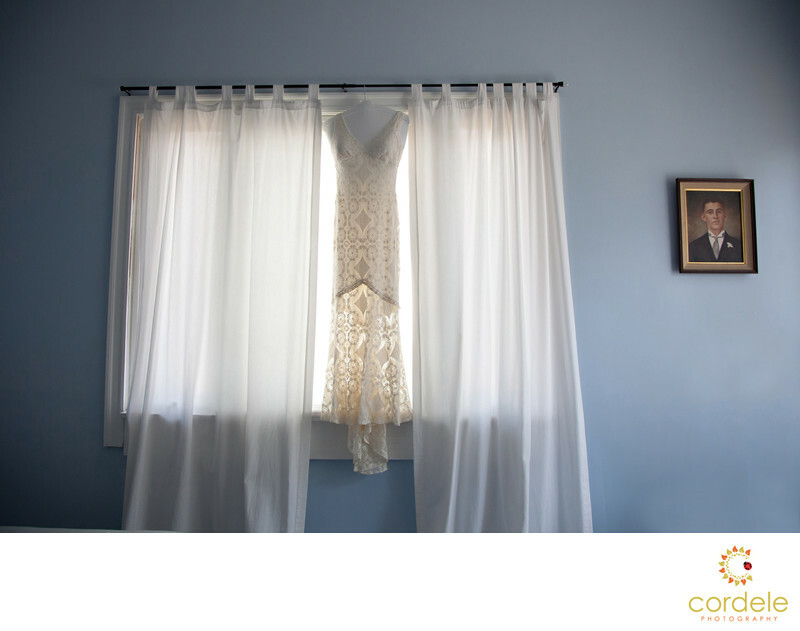 A wedding bridal dress hangs in the window of a home on Cape Cod This photo was from Aislinn and Derek's Wedding. I have such a soft spot for the cape. The wedding took place on Lewis Bay in Hyannis. They rented this house and I was under the impression it was a house that was typically rented. Turns out it was a house that the lady lets people rent out only 2-3 times a year. She is very selective and doesn't let everyone use her home. Its a huge home in a wonderful neighborhood. We even got lucky that the neighbors let us out on their widow walk so that we could get an above the house photo of the party. My second shooter also scaled some stairs of an unfinished house to get an amazing shot from another angle. This photo really represents the simplicity of Aislinns beautiful wedding. Her dress was a very light long dress with a hand crotchet lace overlay. The colors of the wedding wear nautical themed. Every detail they put into this wedding was over the top from the next. She hand wrote in the covers of books that she thought each and every guest might like. She gave them ALL a unique book with a note why they picked that book for them. The time and energy that went into that, showed how much she loved and cared for the people who attended her wedding. They traveled all the way down from Burlington, VT and brought their adorable dog with them. One of my favorite photos of the season was taken at this wedding. It was a photo of them up on the bluff and the blue sky above them. It was just beautiful.